2009 ( FR ) · French · Fantasy · G · 80 minutes of full movie HD video (uncut). You can watch Barbe bleue, full movie on FULLTV - With an austere setting and simple editing resources, Catherine Breillat develops a simple but loving version of the classic Charles Perrault. 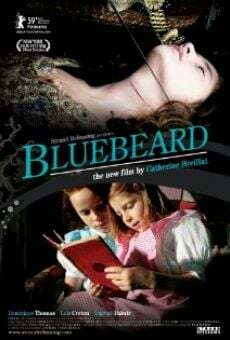 One of the sisters, Catherine, likes scaring the other, Marie -Anne, with fairy tales and insists on reading Bluebeard. The story of the late seventeenth century begins to develop on the screen. Two other sisters fallen from financial grace. After thinking, the youngest agrees to marry the wealthy Bluebeard, even unpleasant as it is, even knowing the whereabouts of their previous seven women. When it comes to travel, she just has to respect the ban on entering the room enigmatic castle. But the curiosity of the sisters opens the way to the expected horror. Breillat gets represent the raw and bloody denouement and maintain the tone of freshness and youthful dream of adolescents in Paris in the 50s. You are able to watch Barbe bleue online, download or rent it as well on video-on-demand services (Netflix Movie List, HBO Now Stream), pay-TV or movie theaters with original audio in French. This film was premiered in theaters in 2009 (Movies 2009). The official release in theaters may differ from the year of production. Film directed by Catherine Breillat. Produced by Jean-François Lepetit and Sylvette Frydman. Screenplay written by Charles Perrault and Catherine Breillat. Soundtrack composed by Stéphane Brunclair. Commercially distributed this film: Aud, Strand Releasing, CCRE, Arte and New Wave Films. Film produced and / or financed by Région Limousin, CB Films, Centre National du Cinéma et de L'image Animée (CNC), Flach Film and Arte France. As usual, the director filmed the scenes of this film in HD video (High Definition or 4K) with Dolby Digital audio. Without commercial breaks, the full movie Barbe bleue has a duration of 80 minutes. Possibly, its official trailer stream is on the Internet. You can watch this full movie free with French or English subtitles on movie TV channels, renting the DVD or with VoD services (Video On Demand player, Hulu) and PPV (Pay Per View, Movie List on Netflix, Amazon Video). Full Movies / Online Movies / Barbe bleue - To enjoy online movies you need a TV with Internet or LED / LCD TVs with DVD or BluRay Player. The full movies are not available for free streaming.